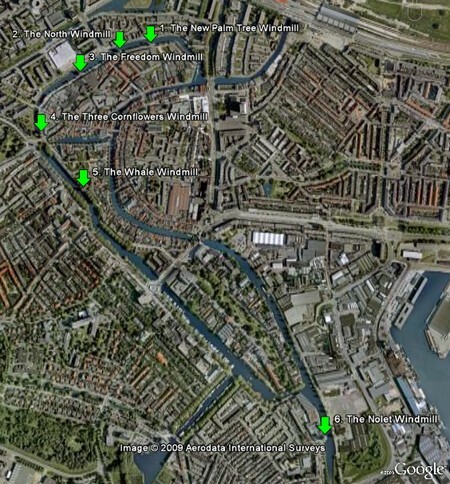 Schiedam, a city and municipality in the province of South Holland and part of the Rotterdam metropolitan area, boasts of not one nor two or three but six tallest windmills in the World. Originally, there were 20 windmills in the the city, mainly built for the grinding of grain for making bread as well as for the local distilleries to produce Jenever - a traditional strongly alcoholic drink of Netherlands (aka Holland Gin). Out of these twenty, only five survived in one form or other and sixth - a new windmill, which looks like the old ones, was constructed in March 2006, to produce electricity for Nolet distillery. 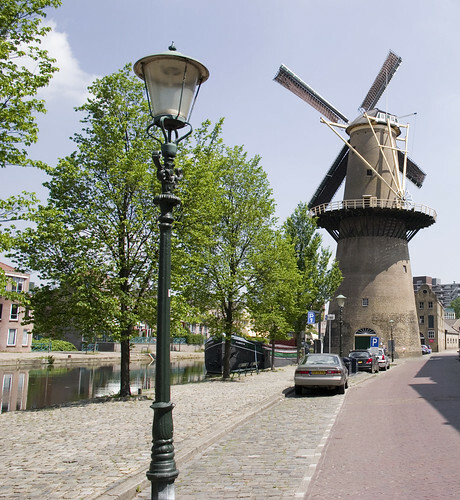 The windmills were initially made from wood, but soon with the growth of the city the mills were rebuilt in stone and elevated so as to catch sufficient wind for their operation. Here is a location map and brief description of each starting from the northern most and going counter clockwise along the canal. Credits: Special thanks to Kite_surfer, whose posts about these windmills in Google Earth Community brought these to my knowledge. The windmill originally known as "Palm Tree" was built in 1781 but a fire gutted it in 1901. It remained in disuse and was re-built in 1991-1993. Renamed "New Palm Tree" it also houses a Museum dedicated to the older mills. Of the five tallest old windmills in the World, "The North" is the tallest. The structure stands 33.3 metres tall while the tips of the blades reach to 44.5 metres. If one takes into account the newly built (March 3, 2006) Nolet Windmill, which is now the tallest then it is second tallest amongst the old ones. A wooden windmill stood around this area from around 1400 which was replaced by a stone windmill in 1707. In 1803 the old stone mill was demolished and rebuilt closer to the waterfront. The mill stopped functioning around 1971 and the building now houses a restaurant. The blades rotate as a show only. This windmill has almost same height as its neighbour "The North" (seen in background) and for long time had staked the claim to be the tallest amongst the old windmills. However an accurate measurement about 20 years ago showed it to be few centimetres shorter than "The North". The windmill was built in 1785 and a gas engine was also installed in 1911 to ensure its working during no wind conditions. The mill however ceased functioning in 1917. It was restarted during the Second World War when peas and beans used to be grinded for the soup-kitchens. After the war all activities stopped again. Restoration was started in 1960 but it was only on 5th November 1974 the mill started working again after an extensive restoration and grain used to be grounded for local bakers. In the late 1990’s restoration work was carried out again. Presently it is only a showpiece and no grinding takes place here. However, the mill is fully equipped and has three pairs of millstones, one of which can be electrically driven in need. The wings are rotated during the weekend and sometimes during the week. The "Three Cornflowers Mill" built in 1770 is the oldest existing mill in Schiedam and second oldest in The Netherlands. At the beginning of the 19th century, the mill was used for mahogany wood sawing and some years later was a rice mill. Later peas, maize and beans were grinded for processing into animal feed. From 1938 till 1950 it was used for pulverising the stones thereafter feed and grain business was re-started. Renovation was started in 1976 and completed in 1999. The mill is presently functional, however some further renovation work is planned. The windmill was established in 1794 and was named after the then booming whaling industry of Greenland. It was mainly used for grinding of grain for Jenever (Holland Gin) distilleries. In Early 20th century the mill suffered repeated damage due to gales and stopped functioning till early 1930 when it started processing magnesium and Carbon-di-Oxide for soft drink companies. In 1996 it caught fire again and was rebuilt in in 1999. It is still functional today for grain grounding. A shop was also opened here in 2001 which sells a wide range of traditional ground flour and bakery products. The Nolet Mill eastabilished in May 2006 is the tallest of the six mills in Schiedam with a height of 42.5 metres and 55 metres blades. It is also World's tallest. Though it looks like a traditional windmill it is actually a wind driven turbo-generator to produce electricity for the Nolet distillery. Acknowledment: I am indebted to Kite_surfer for pointing out mistakes in Dutch to English translation. Thank you once again Kite!